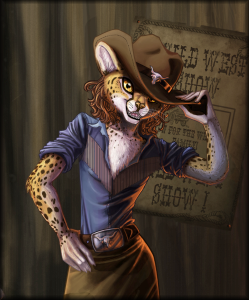 Citra Kayah is an anthropomorphic cheetah from Ted R. Blasingame's upcoming science fiction novel, A Wilder West. This character has two names in the story. Citra Kayah is her "stage name" and Susan Carole Ann Foreman is her birth name. The names originated in 2012 during preparation for working notes on the novel. The origins of her stage name is nothing more than the Sanskrit word for cheetah, citrakāyaḥ. Her birth name is an amalgam of an actress and a character she played in the British science fiction series Doctor Who. The first incarnation of the Doctor traveled with his granddaughter, Susan Foreman who was played by Carole Ann Ford. The use of her name in this novel is not intended to infringe upon the BBC's copyright, but is rather an honorific to the actress and the character she portrayed. Beyond the name itself, there are no other similarities between the characters. Coming Soon: character information data.